Tyson Ward (24) will lead the crop of returning BIson in 2019. For the North Dakota State men’s basketball team, the 2018-19 season came to a close the same way it began — with a double-digit loss to a reigning conference champion. What transpired in between was equal parts irritating and elating. There were growing pains associated with a senior-free roster. The starting lineup and on-court leadership were reshuffled, and NDSU embraced a new offensive identity. The 14 players patient enough to see it through to the end were rewarded with a Summit League title and NCAA Tournament win. The winding journey that was the 2018 season came to an end Friday. The Bison were first round fodder for No. 1 overall Duke, falling to the Blue Devils by a score of 85-62 in the NCAA Tournament. The defeat was humbling, but it didn’t prevent the Bison from picking up just their second March Madness victory. That came the Wednesday prior, when an excellent closing stretch saw NDSU past North Carolina Central. Both the conference championship and tournament triumph were surprising results for the precocious Bison. Truthfully, NDSU’s return to the top of the Summit League came a year ahead of schedule. By all accounts, the Bison were building for 2019. It appeared that head coach Dave Richman was stockpiling young talent in the hopes that by November, the Bison would be ready to launch their assault on the Summit League. That timeline accelerated as NDSU lingered in the top half of the conference standings. Suddenly, the operative date for the new era of Bison hoops was moved to March. It didn’t always look that way, however. That’s where the patience came into play. An inauspicious 17-point loss to New Mexico State opened the season, kicking off a brutal non-conference slate. The Bison finished that stretch 4-8 against Division I opponents, two of whom wound up winning their conference and four of whom also made tournament appearances. In all, NDSU’s non-conference opponents (including NC Central and Duke) combined for a winning percentage of .624. Entering conference action with a losing record didn’t inspire optimism among an increasingly agitated fan base. While many were writing epitaphs for the Bison, the season was a reminder that in the Summit League, all you need is three wins in Sioux Falls. That’s precisely what the Bison got. Sure, Western Illinois came up with a crucial assist by knocking off South Dakota State, but the Leathernecks were a tough out in their own right. Regardless, the Bison were not going to be stopped; a trip to the “Big Dance” had come a year earlier than anticipated. The 2018 Bison ought to be remembered as pulling off one of the most unlikely runs in NDSU history. Their larger legacy will likely be that they laid the foundation for the Bison to return to Summit League prominence. It’s a foundation the same 14 players will have the opportunity to build off. Junior leaders Vinnie Shahid and Tyson Ward will return. So too will 3-point snipers Tyree Eady, Cameron Hunter and Jared Samuelson. Sixth-man Deng Geu will return. Young up-and-comers Jordan Horn, Sam Griesel and Rocky Kreuser will also be back. The bottom line is this: the 14 players who played every second in 2018 will do the same in 2019. That is a scary thought for the rest of the Summit League. Coaches around the league have acknowledged that the Bison will be the team to beat next year. Richman’s enviable position wasn’t lost on Duke head coach Mike Krzyzewski either. “Watch out. They’re going to be that team in their conference. That’s my prediction,” Krzyzewski mused. Key for the Bison in 2018 was their depth. That will no doubt be a strength again in 2019, likely to an even greater degree. Jarius Cook and Jaxon Knotek saw limited minutes in their freshman seasons, meanwhile Jordan Meidinger and Odell Wilson IV have yet to feature for NDSU. If even one of those four can take a step forward, it makes the Bison all the more lethal. Another element working in NDSU’s favor is their newfound embrace of the 3-point shot. 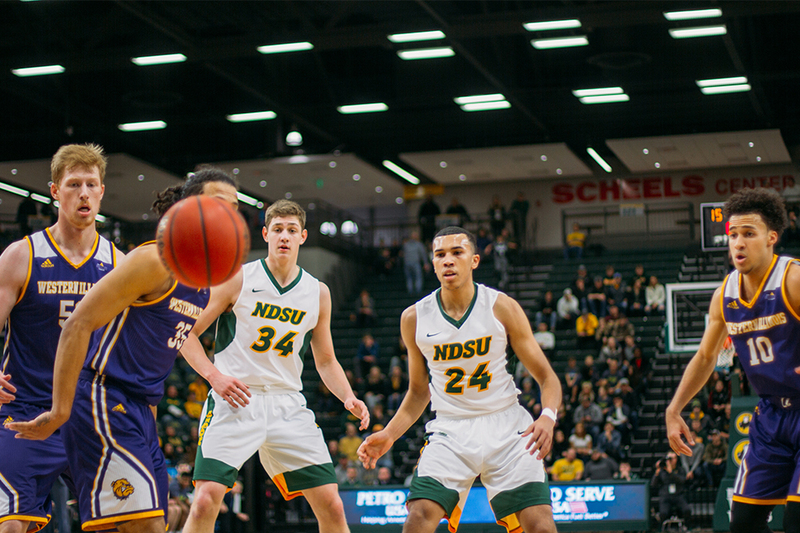 The Bison set a program record for made 3-pointers, a crucial development in a conference in which the best teams average 80-plus points a night. With a new framework in place, there’s no reason to think the Bison won’t be back in this position a year from now. With good fortune and an uptick in wins, the run might not have to end so soon.